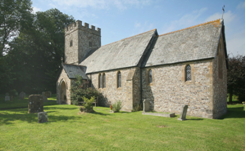 St James the Greater is a small early Grade 2 listed 19th century church with a 12th century tower, located in the small Devon village of Sheldon, in the heart of the beautiful Blackdown Hills, an area of Outstanding Natural Beauty. In a small village such as this, the church plays a key role in the lives of the 167 adults and 24 children who live here. The housing consists almost entirely of owner occupied houses, with a scattered farming community. Because the village has no shops or public house, there is an active social life, with the church and the Village Hall forming the key components. There are regular events arranged by the PCC, and the Village Hall Committee organises a range of social activities including a Table Tennis Club, Craft Club, Yoga, Coffee Mornings and Harvest Suppers. Worship times and styles attract people from neighbouring villages and in the tradition of the Blackdown Hills, services tend towards ‘low church.’ There is a great deal of goodwill from village people who attend church either infrequently or not at all, giving their time freely with maintenance work and by helping out at fund raising events. Congregations over the last 3 years have increased. There has been a recent increase in young children to Sheldon. Our Family Services are very well supported averaging 20 of all ages over the year. Children provide practical help and they are also encouraged to help during other services. Coffee mornings, fund raising events and suppers are very well supported. We have a flower team managed by an expert flower arranger which ensures the church is beautifully decorated. The churchyard is excellently maintained by a team of grass cutters, who also provide their services free of charge. A few local ‘photographers’ have taken photographs of the church which are for sale with the proceeds being donated to the church. A team of organists provide impressive music for all the services. Those who attend Bible Studies do so at Dunkeswell with whom we have a close relationship. Average Sunday attendance consists mainly of retired people but with a recent increase of younger members. The church is exploring more suitable means of involving children: we have insufficient young children to form a Sunday School but would like to encourage younger adults to organise a church-related youth club in our village hall. We aim to discover what parents and young children would like to do. Lay Ministry – lay people lead Morning Prayer and Family services and plan special services when needed, thus ensuring that services are not cancelled. The vicar presides at Holy Communion and, if he is unavailable, retired ministers from neighbouring parishes preside. As well as being very much a part of Dunkeswell Parish Magazine, the church and its activities have the lion’s share of coverage in Sheldon Matters – a village broadsheet – and most effective posters in notice boards keeps the Church in high profile. A programme showing the month’s services is on the church notice board along with a list of the charities to whom the church have donated for that year. The Churchwardens and Vicar know, and are known, by almost all parishioners, and much lay visiting occurs as a matter of course, being a small community. The occasional special services also give rise to regular pastoral care, are well attended and give opportunity for outreach. There is an intercessions book in the church so that extra prayers can be said during the services. There is a notice in the church giving details of our Safeguarding representative.